First, I have a housekeeping matter to discuss. If you're not aware, foodbuzz is a social media website for food bloggers, but has recently announced by its parent company, Federated Media Publishing, that it will no longer exist effective at the end of this month and will be consolidated with it's Daily Buzz Food. After discussing it with some other food bloggers, I have decided not to move to the new site. If you enjoy reading about my dishes and want to keep in touch, you can add me on Google+ or Pinterest, but the best way to reach me is to 'Like' my facebook page because I'm more active there. I don't have a twitter page because I find too many social media networks are too time consuming to manage. It's unfortunate because I've discovered many other blogs I now enjoy reading from foodbuzz, but I also found their recipe search useful because I can narrow down the recipes by certain criteria. Other sites that have similar recipe search functions are foodily, gojee, and feastie, however the networking abilities foodbuzz has provided are what I will miss most. Please leave a comment with some of your favorite blogs (not including your own) that don't necessarily have to be food related you think I should follow. In other news, over the weekend, I competed in an amateur rib contest organized by a college friend and her husband. I altered Michael Chiarello's recipe slightly by using St. Louis style spareribs and oven smoking them. I was planning on using the competition to learn from my experience should I choose to enter sponsored competitions but I ended up winning in the Best Overall Rib category. My prize for winning was an apron, a plaque, and bragging rights for next year's competition. I'll have some more crazy stunts in August! I'm a little embarrased by all this good fortune but I was chosen the winner of a giveaway sponsored by Kaitlin of I Can Cook That. Thank you very much! When my wife and I were first married, we would eat at chain restaurants about once or twice a month. Often, we would end up at Chili's Grill & Bar. Fast forward to late 2009 when my wife took me there for my birthday. I hadn't started a food blog yet but I had found a baby back ribs recipe by Dave Lieberman (using store bought barbecue sauce) I really liked after my brother-in-law demonstrated his version he brought with him from the Philippines and I wanted to find something that originated from Southern barbecue. I figured baby back ribs was a signature dish, so it would be a pretty safe choice. The ribs I made at home were so much better by comparison and cheaper too. In short, I felt ripped off. In fact, my first recipe for Food By DB was the recipe above, which served as one motivation to start blogging in the first place. About a year ago, I updated my recipe using Chef Michael Chiarello's recipe using his barbecue sauce. The best way to prepare ribs is to smoke them but this is apartment living folks, and I am not able to due to space constraints. Also, these two recipes used a similar cooking method and needed to mix things up a bit. Not only recreate, but improve a dish served at a restaurant chain, in this case Chili's baby back ribs with original barbecue sauce. 1. I've already reviewed the benefits of a brine with my chicken & rice recipe I published a couple of months ago, but I've never brined pork ribs. If I can't smoke my ribs, can I enhance flavor with a brine? Going in, I was a little skeptical that a short time in the brine would be effective. 2. This recipe is different than the cooking methods I've used in the past but it is very similar to rib recipes used by Bobby Flay I've tried in the past. 1. In a medium saucepan over medium-high heat, add the olive oil. When the oil is hot, add the onion and Anaheim and cook until the onion is translucent. Stir in the garlic and the ginger and cook for 1 to 2 minutes longer, being cautious not to burn. 2. Deglaze the pan with the vinegar and then add the frozen raspberries, preserves and maple. Stir to combine, then lower heat and simmer for 15 minutes. 3. Puree with an immersion blender, then strain through a sieve into a bowl or jar, to remove the seeds, pushing the sauce through as much as possible. Can be stored, covered, in the refrigerator for up to a week. 4. Preheat a grill to high and an oven to 400°Fahrenheit. 5. In a large resealable bag or nonreactive container; combine the vinegar, water, 1 tablespoon of the salt and 1 tablespoon of the pepper, 4 of the garlic cloves and the ribs. Let sit at room temperature for 15 minutes only. 6. Remove the ribs from the brine and season both sides with the remaining salt and pepper. Sear the ribs on an indoor grill or outdoor if available, until lightly browned. 7. In a large roasting pan, fitted with a rack, arrange the ribs on the rack and pour in the beer. Add the onion and remaining garlic cloves. Cover the pan tightly with aluminum foil and put into the hot oven. Reduce the heat to 300 and roast for 1 1/2 hours. Remove the foil and baste the ribs with the BBQ sauce. Roast for 7 minutes, then turn the ribs over, baste again and roast for another 7 minutes. Remove the ribs from the oven to a cutting board and slice between the ribs. Arrange on a serving platter and serve. The raspberry sauce was a little too sweet and I liked Chef Chiarello's better but it still was an improvement over Chili's. The brine also was effective in keeping the ribs succulent. Before I start discussing this dish, I'd first like to thank Donna and Chad of The Slow Roasted Italian for choosing me as the winner of their Fresina's Pasta Company and Italian Specialties Giveaway! If you get a chance, check out Fresina's at their website. You'll see these ingredients used here soon. I really like this dish because it's visually striking, yet easy enough for a weeknight meal. I've also never seen pasta prepared so creatively. 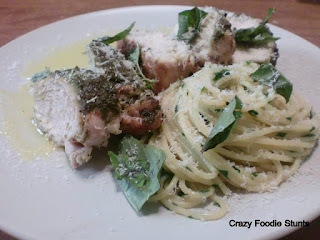 Perhaps this could be a first course for the pesto chicken recipe I profiled last week? A note of disclosure: This is the dish I referred to in my chicken teriyaki recipe a few months ago. I wanted to go back to correct the mistake I referred to earlier. Practice my plating and photography skills while correcting a flaw in the cooking instructions. This recipe appears on page 104 of Michael Chiarello's Bottega by Michael Chiarello with Ann Krueger Spivack and Claudia Sansone, but I originally found it on Tasting Table. I have used the updated version on Chef Chiarello's own website, NapaStyle here. 1. Cut broccoli into 1-inch wide florets. Blanch in a 6 to 8 quart pot of boiling salted water, uncovered, 2 minutes. Transfer with slotted spoon to a large colander to drain, reserving broccoli-cooking liquid in pot, then transfer broccoli to a bowl. 2. Return cooking liquid to a boil and cook spaghetti, stirring occasionally, for 5 minutes only. (Pasta will not be fully cooked). Reserve one cup of pasta water and drain pasta in colander and return empty pot to stovetop. 3. Add wine and sugar to pot and boil vigorously 2 minutes until liquid is reduced a bit. Add spaghetti and shake pot to prevent pasta from sticking. Gently stir with tongs until coated and boil over high heat, stirring occasionally, until most of the liquid is absorbed, about 6 minutes (Pasta should be al dente). 4. Immediately after adding spaghetti to wine mixture, cook garlic and red pepper flakes in the olive oil in a large, deep skillet over medium-low heat, tosing the ingredients occasionally, until garlic is pale golden, about 5 minutes. Add broccoli, salt, and pepper and cook, stirring, 1 minute. Add 1/2 cup of reserved pasta water. 5. Pour broccoli into pot with the spaghetti mixture and carefully toss with tongs to combine. Cook while stirring, about 2 minutes. Remove from heat, season with freshly ground black pepper and drizzle with a bit of olive oil. Stir in the grated cheese. Serve immediately. Yes! The broccoli never splattered like my first experience with this dish. I was also skeptical the broccoli would be cooked through, but it was allowed to cook after they were removed from the water. Recognize this dish? Again, I struggled with the idea of publishing this dish here because it's not that challenging and I wanted to keep you all guessing the dish behind the title above but this is too good not to share. Recreate restaurant style elegance on a weeknight at home. This Curtis Stone recipe has been adapted from Huffington Post. 1. For the pesto, combine the garlic cloves, basil, walnuts, Parmesan in a blender. With the blender running, slowly drizzle olive oil into the blender until the mixture is a loose paste. Season the pesto to taste with salt and pepper. Set aside. 2. Preheat the oven to 400°F and fire the salted water over high heat to a boil. 3. Heat tablespoon of oil in a large oven-proof sauté pan over high heat. Season the chicken on both sides with salt and pepper. Cook the chicken breasts just until golden brown but not yet cooked through, about 2 minutes per side. Remove the pan from the heat. Spread the pesto over the top of the chicken breasts. 4. While the chicken cooks in the oven, drop the pasta in the boiling salted water until al dente, stirring occasionally to prevent it from sticking (about a minute less than the box instructions dictate). Drain the pasta, reserving 1/2 cup of the pasta cooking water in a large sauté pan over medium heat. Whisk 1 tablespoon of olive oil into the reserved pasta cooking water to blend well. Add the spaghetti and parsley and toss to coat. 5. To plate, use a two-pronged carving fork swirl some of the pasta around the fork and slide the pasta off the fork and mound it in the center of a plate. Repeat for each serving. Cut each chicken breast crosswise and on a bias into 4 slices. Fan the chicken slices alongside the pasta. Garnish with shaved Parmesan cheese, and torn basil. Drizzle the remaining 1 tablespoon of oil over and serve. I normally don't take pictures of my prep work, but in this case I wanted to highlight the importance of toasting the nuts used in the pesto. It gives pesto another dimension of flavor. Put the nuts in a dry sauté pan over medium heat, tossing every minute until lightly browned. Absolutely! With the pesto prepped beforehand, I was able to complete steps 2 through 5 in under an hour, which makes this dish perfect for weeknight entertaining.